A statement from Saudi Arabia’s public prosecutor on Tuesday indicated that most of the suspects swept up in the recent anti-corruption crackdown will be released after reaching settlements with the government. A sizable number of detainees, however, remain in detention, and some of those will be prosecuted for their offenses. The statement said “320 people had been subpoenaed to provide information about alleged graft while 159 remain in detention and ‘a number’ of them have been referred for judicial action,” according to Reuters. At one point, the bank accounts of some 2,000 suspects had been frozen, but the number is down to 376. “The allegations, which could not be verified, include kickbacks, inflating government contracts, extortion, and bribery,” the Reuters report adds. The deal worked out with the detainees, largely held at the luxurious Ritz Carlton Hotel in Riyadh, evidently involves dropping the charges against them and securing a royal pardon in exchange for handing over the allegedly stolen funds without too much of a fuss. Most of those who settle will be permitted to remain anonymous. Crown Prince Mohammed bin Salman stated last month that only about one percent of the detainees have been able to prove themselves innocent of the charges, while only four percent have expressed a desire to fight their corruption accusations in court. Reuters notes one of the accused who seems prepared to contest the charges is a dual French and Saudi national who has inquired about securing consular protection. Prince Alwaleed, who is among the richest and most internationally famed men in Saudi Arabia, is worth about $16 billion all by himself. Or at least he was because his settlement offer is said to involve handing over most of his assets and a lifetime of house arrest. Alwaleed is rumored to have refused this unappealing offer and signaled a desire to contest his charges in court, a trial that would likely dominate Saudi news for months and create the kind of economic uncertainty the monarchy is desperate to avoid. Saudi Minister of Commerce and Investment Majid bin Abdullah al-Qasabi told Reuters on Wednesday that he believes the primary wave of arrests is completed but added the government “will not keep its mouth shut when it sees a corrupt case” in times to come. Qasabi added that Saudi Arabia’s economic reforms are on track, including a $300 billion privatization program, with significant milestones expected in 2018 and 2019. 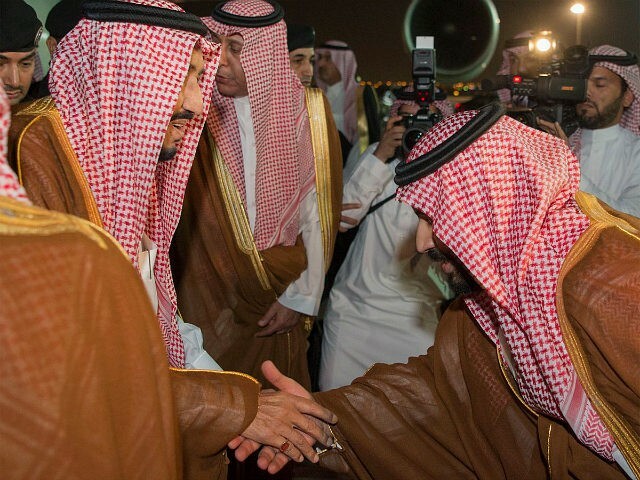 Foreign investment is to be a major element of the Kingdom’s shift away from an oil economy, as envisioned by the Crown Prince. Qasabi essentially conceded that instability from the anti-corruption crackdown is viewed as a necessary price to pay for convincing investors that Saudi Arabia will be a safe place for their money in the future. Alaco director Ambrose Carey writes at Business Insider that the great anti-corruption drive was largely an attempt by the Saudi government to claw back huge amounts of money frittered away by self-indulgent royals during the heyday of the oil industry, funds that will now be desperately needed to lubricate the Kingdom’s transition to a post-oil economy and shore up defenses against the great regional threat of Iran. “The fall in the price of oil – the kingdom’s main source of revenue – has led to a huge budget deficit, which stood at $79 billion in 2016. The government has had to use foreign reserves to help cover the revenue shortfall, with the former shrinking by about a third over the last three years. The recession has forced MBS to rein back public spending, alarming cosseted Saudis long accustomed to cradle-to-grave subsidies,” he notes. But Carey argues this financial agenda is unlikely to succeed, in part because so much of the royal grift has been spent or sheltered overseas, putting skeptical financial advisers and business partners overseas in charge of the assets the Saudi government wants to recover. “So, in all likelihood, MBS will struggle to generate the money he needs. Worse still for him, his actions could have deleterious consequences for the economy. While the acquisition of assets and cash is likely to play well with ordinary Saudis weary of corruption amongst the royals and the business elite, it may unnerve already jittery foreign investors whose engagement is critical to the Crown Prince’s economic plans,” he concludes, adding the kicker that, given the state of Saudi finances and the challenges facing the Kingdom, it might have been Crown Prince bin Salman’s best play anyway. Bold and visionary as he seems, rash and impulsive as he might be, the 32-year-old heir to the throne came along about 32 years after all the easy options and solid plans expired.